Regular readers here know that by and large I adore Manmohan Desai and his films and can mostly forgive him for anything except Ganga Jamuna Saraswati. It has long been my great sorrow that two of his movies, Shararat and this one, are not available with subtitles. Manmohan Desai’s complicated plotting has always seemed daunting without them and though I have had both films for a long time I never quite had the courage to watch them. So imagine my great joy when I finally sat down with this one and (despite no doubt missing many nuances) could actually follow what was going on. There is a lot going on! As is usual for him, he sets up the many characters and plot threads masterfully. Creating a web of relationships torn apart by misunderstandings and loss, he carries us along breathlessly rooting for our protagonists to *just stop already* missing each other by mere inches and find their way back to the lives they should be leading. As is also usual for him, the last 45 minutes or so go completely and a tad disappointingly off the rails into Crazy-land, taking the focus away from the pure emotional joy of the reunion(s), but never mind. I still love this film. 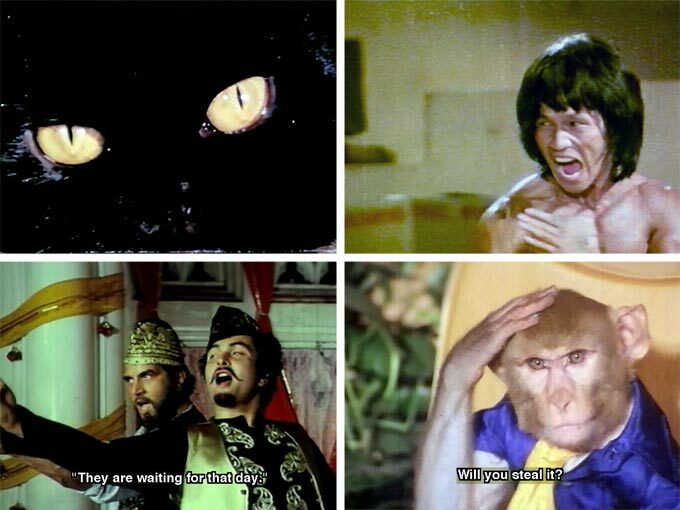 If Dharmendra playing Zorro and rescuing pretty young things isn’t your thing, how about these options? 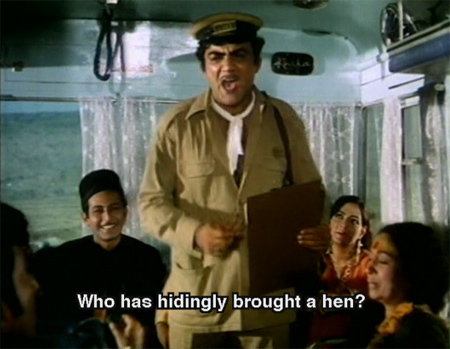 Dharmendra chasing down a train! Dharmendra swinging through trees like Tarzan! Dharmendra taming wild horses! Dharmendra wrestling tigers! Dharmendra saving a man in chains from a burning building! Dharmendra saving the honor of women everywhere! Dharmendra impersonating a holy man! Dharmendra romancing the Dream Girl! 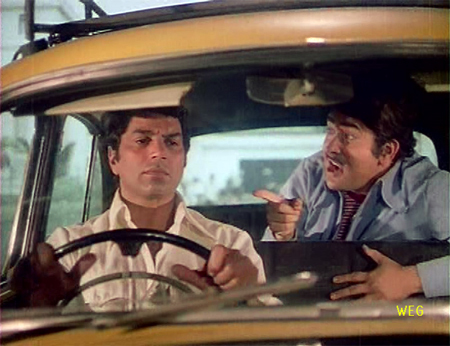 Dharmendra escaping the Loony Bin of Death! I was inspired to get a second copy of this film (a copy with subtitles) by Banno and I’m so very very glad I did. I am sure you will understand the attraction once you read her description of the action. 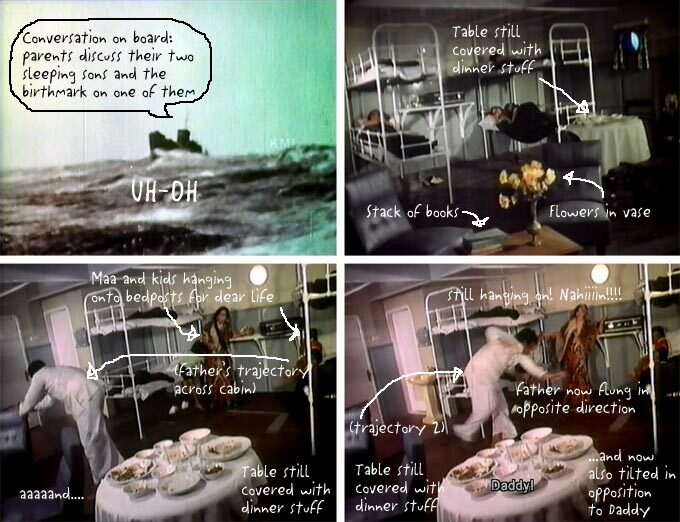 Beth did, and Todd too—so watch out for what I am sure will be their superb analyses of this masala masterpiece as well. It’s a fun story that moves along at a brisk pace embellished with oodles of cracktastic detail. After months during which this Chetan Anand film was “next” in my to-watch list, I finally got around to it. And I’m glad I did; it is compelling viewing. Having said that, I’m not sure what exactly what else to say about it. Unusual story? Check. Good cast and performances? Check. Nice music? Check. Good movie? Uhhhhhh…I think so? Maybe? In the end it felt a bit schizophrenic: it is a reincarnation story—and leads you firmly down that path—but then also drags in some token debate about reincarnation being a silly belief held by uneducated riff-raff. It also wanted to be a “serious” suspense film (and succeeded to a large degree), but was very lazy about some details (medical and legal practices, for one, and some pretty stringent suspension of disbelief requirements too). So I spent a lot of time feeling pulled in one direction, and then nudged in another, and the whole never quite came together for me. The fact that the subtitles disappeared entirely during the climactic courtroom speech didn’t help at all either (and thank you to Suhan for sending me a synopsis!). 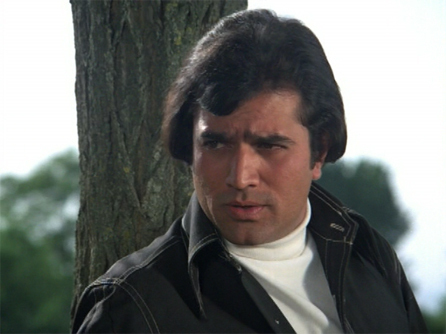 But: I couldn’t stop watching it, as the suspense was built very nicely, and the performances were really good, especially Vinod Khanna as a doctor who loses his love to the man she loved in a past life; and Rajesh Khanna as the man who is pulled unwillingly into a story involving him but of which he has no memory. The sets and the Simla scenery were beautiful, and the cinematography stunning, and RD Burman’s music very nice too.